Starting just another vegetarian eatery was not an appetising thought for partners Jignesh Pujara, Yeshwin Mathew and Tanish Thomas. 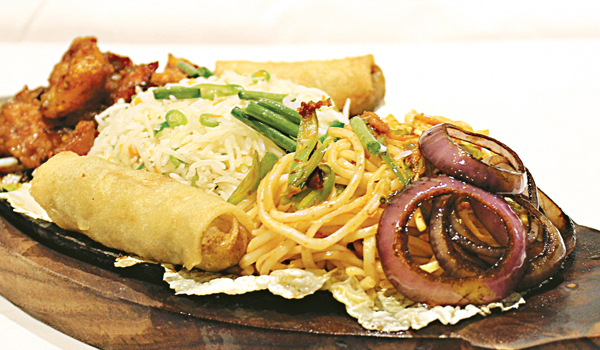 Their twist to the tale: a restaurant that serves only the most popular dishes from a variety of global cuisines. The trio behind Soul Garden, the new 50-seater all-vegetarian cafe in Alwarpet, are old hands in the food businessa��Pujara (in his late 30s) owned the city franchise of frozen yogurt chain Menchiea��s, while Mathew (26) and Thomas (31) run Brick House Bistro. a�?We will also have a separate dessert space, specialising in nitrogen ice creams, called 196 Below, which will be managed by Pujara,a�? reveals Mathew, adding that Soul Garden will have its soft launch on Tuesday, followed by the official deal next Sunday. We walk in to find the al fresco area still getting its finishing touches. a�?We are literally racing against time to be ready for the launch,a�? smiles Mathew, as he leads us inside where the mood is set with shining vintage-style overhead lamps. As he talks about the water-colour paintings by a local artist that will soon adorn the empty walls, we settle down on one of the couches. a�?We have tried to include the most popular dishes from different cuisinesa��be it pastas and pizzas from Italian, rice and paneer makhani from Indian fare, hummus and pita from the Middle East, and burgers and sandwiches among fast food,a�? says Mathew, who finalised the menu after several months of trials. The dessert parlour will offer liquid nitrogen gelatos, waffles, a�?freaka�� shakes and more. We start with a Caesar salad and French fries that get full marks for generous amounts of cheese. Up next is a pesto sandwich, with rosemary panini stuffed with tofu, tomatoes and fresh greens. The bread is soft, with the sharp tang of rosemary. a�?We source it from a city-based wholesale supplier, Crust Bakes,a�? says Pujara, adding that the sauces are all made in-house. By now we are quite full, but a plate of zucchini chips and two kinds of thin-crust pizzas catch our attention. While the first comes with a red sauce, I prefer the second, topped with fresh basil pesto sauce. We end our meal with delicious thick shakesa��an Oreo and a peanut butter-coffeea��that can almost be a meal by themselves, coming as they do with tonnes of chocolate, wafers and marshmallow. Meal for two from around `600.